"Sometimes things would happen, I'd have to kill a few people. I'd feel bad for a while but then I'd jump into the ocean, swim way out. Come back in feeling nice and clean, start all over again." Reinventing yourself is something that the self-help industry all too profitably encourages. It's all too seldom successful, however, as old habits are definitely hard to break. A simple makeover or a facelift may work for a little while, but if the core is still rotten, nothing really changes. 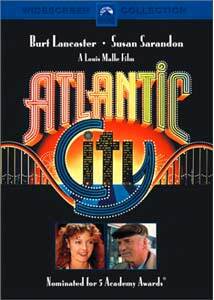 Rebirth is the theme of Louis Malle's Atlantic City, set in a time just after gambling casinos were reinstituted there in hopes of bringing back the city's once-vibrant life. Lou Paschall (Burt Lancaster) is an aging, small-time numbers runner being put out of business by the casinos. His neighbor, Sally Matthews (Susan Sarandon) is trying to make a go of learning to be a dealer in a casino so she can get out of the fish shop where she's working. Sally's errant husband Dave (Robert Joy) and her sister Chrissie (Hollis McLaren), whom he has gotten pregnant, show up on her doorstep looking for shelter until Dave can make a big score. The problem is, the thing that Dave wants to make the score with is stolen cocaine, and the Philadelphia mob is not pleased with his entrepreneurial efforts. Dave gets himself killed and Lou ends up with the coke. Taking over where Dave left off, Lou sets himself up as a would-be hood of the first order and starts to woo Sally. But just like the city, he finds that reinventing himself is not as easy as putting on a new white suit. This picture is unrelentingly bleak in its attitude. Whenever the characters and the city make any effort to improve their lot in life, they're stepped on, hard. A slightly upbeat ending feels tacked on and false to the mood of the film itself, which is otherwise a picture of the boulevard of broken dreams. As if to underscore the theme of renaissance, the would-be mobster's surname, Paschall, is reminiscent of a term for Easter. Please, Louis, hit us on the head with a hammer, okay? The cast is first-rate, with Lancaster believably filling the role of the small-time hood futilely trying to crack the big time. Sarandon is marvelous as always, and radiantly beautiful. You may never look at lemons the same way again after seeing the justifiably famous opening sequence. Malle creates attractive tableaux for the scenes here, but they can't quite lighten the heavy tone. Intriguingly, when Dave and Chrissie are shown early on, they're almost always nearly stepping out of the frame, as if they're impatient to be held back by the language of the motion picture itself. But in the end, as the closing shot proves, there is really no escape from the wrecking ball, despite promises of peaches and cream on the boardwalk in Atlantic City. For some reason the lengthy MPAA rating card at the beginning is unskippable. Image Transfer Review: The 1.85:1 widescreen picture looks great, as is usually the case for Paramount. There's plenty of detail, solid colors and attractive black levels. Only the most occasional speckle detracts from the viewing pleasure. Audio Transfer Review: The 2.0 mono track sounds fine, with clear dialogue even though most of it seems to be recorded on set rather than looped later. The ironically chipper musical interludes sound perfectly good as well, without distortion, hiss or noise. Extras Review: The only extra is a trailer that's seen better days, but at least it's presented in anamorphic widescreen. Chaptering is decent if not great. A grim picture supported with a terrific cast, given a very attractive transfer. Not much for extras beyond a trailer, though.